This indicator visualizes the intersection of two moving averages in the MACD oscillator. It uses the histogram color to signal about the moving averages crossing the zero level of the indicator. 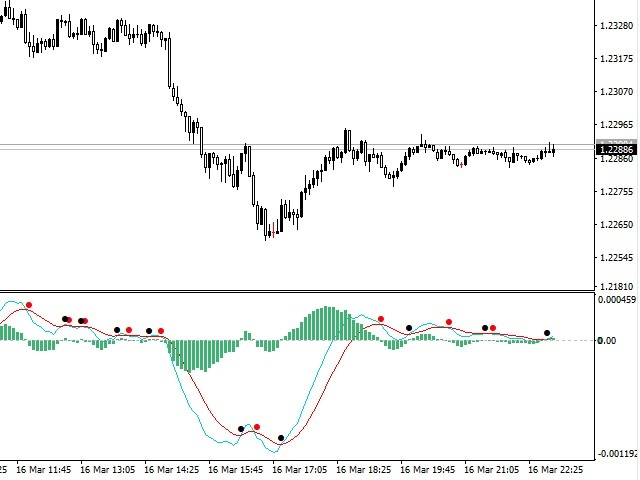 The MACD (Moving Average Convergence/Divergence) indicator is a popular oscillator actively used by traders when working in the currency and stock markets to determine trends and to search for trading signals. intersection of the support/resistance levels (when used). Note (when used): in the input parameters of the indicator, in the Levels tab, add a level of 0.00 and two levels -0.0004 and 0.0004. When the moving averages cross the zero level, the histogram color changes depending on the direction. When two moving averages cross each other, a blinking icon appears above them. change the histogram color (depending on the position of the moving averages relative to the zero level). Period fast EMA - period of Exponential Moving Average (fast), default: 12. Period slow EMA - period of Exponential Moving Average (slow), default: 26. Period MACD SMA - period of Simple Moving Average for smoothing, default: 9. Signal "Buy" icon code - character code for buy signals, default: 159. 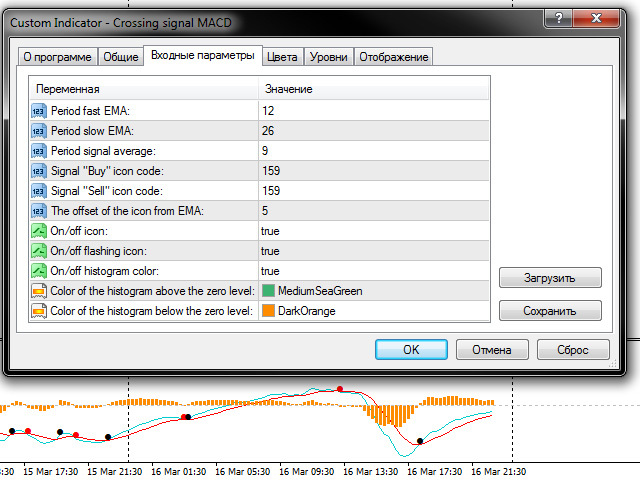 Signal "Sell" icon code - character code for sell signals, default: 159. The offset of the icon from EMA - offset of the icons from the moving averages, default: 5. On/off icon - enable/disable icons, default: true (enabled). On/off flashing icon - enable/disable blinking of icons, default: true (enabled). On/off histogram color - enable/disable changing the histogram color, default: true (enabled). Color of the histogram above the zero level - color of the histogram, when ЕМА is above the zero level. Сolor of the histogram below the zero level - color of the histogram, when ЕМА is below the zero level. 0 - color of Exponential Moving Average (fast), default: DarkTurquoise. 1 - color of Exponential Moving Average (slow), default: Red. 2 - color of the histogram when changing the histogram color is disabled, default: Gray. 3 - color of Moving Average (slow), default: DarkOrange. 4 - icon color for the "Down" signals, when the fast moving average breaks through the slow moving average downwards, default: Red. 5 - icon color for the "Up" signals, when the fast moving average breaks through the slow moving average upwards, default: Black. The signal of intersections can not be used as the main signal for opening deals. Before use, it is recommended to learn more about the standard MACD oscillator. Note: MACD is usually called a "lagging" indicator, that is, generating signals based on information about prices in history. Therefore, it is nest to use MACD in the markets that are characterized by stable trends.